It seems the only thing more important to business travelers these days than their Wi-Fi access is the suitcase that contains their clothes. As high-speed, constant Wi-Fi connectivity has become a must for business travel, Wi-Fi availability has expanded from conference centers, to hotels, to airplanes, to trains, to cars, and to almost every point along a traveler’s path now. Syniverse recently helped the industry take another step forward with serving this need by contributing to a new white paper by the Wireless Broadband Alliance. The Alliance, which Syniverse has long been a member of, recently published “Wi-Fi Roaming Business Case White Paper” and has provided a comprehensive guide to setting up Wi-Fi roaming – the automatic provisioning of connectivity to users across different service providers’ Wi-Fi networks, and a vital service for business travelers. Critically, the paper brings together the firsthand lessons learned from the Alliance’s global operator members, which collectively serve more than 2 billion subscribers and operate more than 25 million hotspots globally. In sharing these lessons, the paper marks important progress toward helping alleviate the inconsistent experience that many mobile users face when they attempt to use Wi-Fi when traveling. This experience can include everything from different authentication methods, to inconsistent security standards, to overloaded capacity. These can add up to frustrated, data-hungry consumers as well as disappointed Wi-Fi operators that don’t realize the volume of traffic they expect. More seamless roaming between hotspots. Broader access to a much larger commercial Wi-Fi network. Extended mobile network reach through multiple mobile connectivity methods. Opportunity to instantly gain a large footprint of available hotspots rather than gain this through organic growth. Avoidance of major network capital and operational costs. Syniverse’s contribution to the paper builds on a long history with the Wireless Broadband Alliance, including our help with the demonstration of a Next Generation Hotspot network at last year’s Wireless Broadband Alliance’s Wi-Fi Global Congress conference as well as last year’s Mobile World Congress. In addition, our work with the Alliance has included contributions to the Wireless Roaming Intermediary Exchange specifications and the Wireless Broadband Alliance-GSMA Wi-Fi Roaming Taskforce, among other efforts. 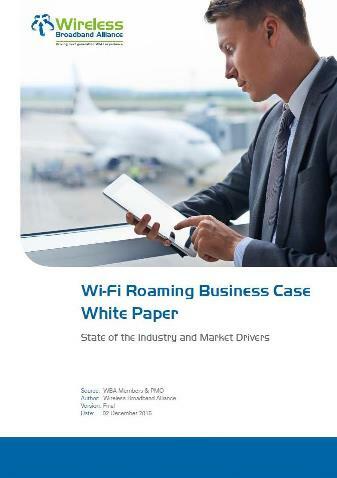 I invite you to find out more the future for Wi-Fi roaming by downloading the white paper from the Wireless Broadband Alliance website and learning about this rapidly developing area of mobile. Personally, I see this Wi-Fi roaming as one part of a larger opportunity for the development of Wi-Fi that is similar to the development of mobile networks. Just as in the early days of mobile there were many providers with separate networks, and just as the industry worked together to connect their networks as consumer demand grew, I think that Wi-Fi will one day become a seamless, complementary data service for a mobile device where my device will be able to select the best connectivity option for me based upon signal availability, network performance and price. I look forward to seeing how this evolves and to playing a part in it as a member of the Syniverse team contributing to the Alliance. Do you think global Wi-Fi access will be made easier in the next few years? What kind of places do you think need more seamless Wi-Fi access? Please let me know your thoughts by leaving a comment.